USN Muscle Fuel Anabolic is a scientifically engineered muscle building MRP supplement, formulated for athletes that are serious about building muscle mass. Add 3 scoops to 500-600ml of cold water, then use a blender or hand held shaker for 30 seconds to make a great tasting strawberry shake with 53g of protein and 5g creatine. Have one or two servings daily (servings may be halved). Persons under 80kgs - Have 2 servings per day for the first 5 days and only 1 serving per day there-after. Persons over 80kgs - Have 2-3 servings per day for the first 5 days and 1-2 servings per day there-after. Carb Matrix (Maltodextrin, Dextrose monohydrate, Fructose), Protein Matrix [Whey protein concentrate (Milk), Soya protein isolate, Milk protein isolate, Egg albumen, Calcium caseinate (Milk)], Creatine monohydrate, Flavouring, Thickeners (Guar gum, Xanthan gum), Starch, L-Glycine, Shortening Powder [Palm Oil, Whey (Milk), Milk Protein, Stabiliser (Sodium Tripolyphosphate), Anti-caking agent (Silicon Dioxide), Antioxidant (Tocopherol)], Calcium beta-hydroxy beta-methyl butyrate, Beta-alanine, Branched Chain Amino Acid (BCAA) powder 2:1:1, Tri-calcium phosphate, Colour (Beetroot Red E162^^), Magnesium lactate, Tri-potassium citrate, Stabiliser (Cellulose gum), Sodium chloride, Taurine, Sweeteners (Sucralose, Acesulfame-K), L-Glutamine, Avena Sativa [Oats (gluten)], Vitamin blend (Ascorbic acid, Pteroyl-l-glutamate, D-alpha tocopherol, Nicotinamide, D-calcium pantothenate, Riboflavin, Pyridoxine hydrochloride, Thiamin hydrochloride, Retinyl palmitate, Methylcobalamine, Biotin, Cholecalciferol), Glutamine Peptide [Wheat (gluten)], Natural Colour (Anthocyanins, Safflower extract), Anti-caking agent (Silicon dioxide), Zinc bisglycinate, Tolerase L (pH-stable lactase). Do not combine Muscle Fuel Anabolic with any other creatine product and do not exceed the recommended daily intake. Not suitable during pregnancy, lactation or for persons under the age of 18.This product contains Milk, Soy and Gluten. 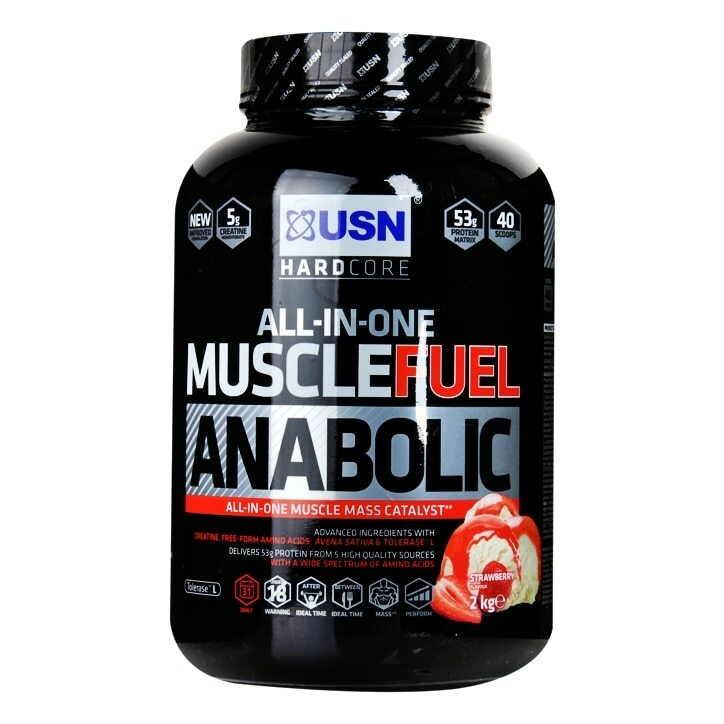 USN Muscle Fuel Anabolic Strawberry is rated 4.6 out of 5 by 39.